I grew up in Newark, New Jersey, one of six children. I have been married for 23 years. I own a home, and I have two children. I have been at the same job for 25 years. I am the happiest I have ever been and it is all because of the Love that has always been in my life. I attribute all that has happened to me to that Love. None of what has transpired in the last five years of my life has anything to do with any accomplishments on my part. There was always a lot of love in our home as I grew up, but for reasons unknown to me at the time I was always in trouble. I was at the top of my brother-in-law’s “Who My Sister Shouldn’t Marry” list. I drank alcoholically, gambled, abused drugs and painkillers. I bounced from relationship to relationship. Even after I stopped abusing alcohol and drugs in 1987, my so-called outer troubles stopped, but my self-centered behavior never changed. All I did was substitute one compulsion for another. Although my addiction became more respectable—taking the form of material possessions—I was still trapped, migrating restlessly from one obsession to another. I went to Twelve Step meetings, derived some benefit from them, and then fell away. My loved ones got me into de-tox and rehab programs. But once I was released, the cycle of insatiable craving started all over again. This cycle seemed to work for me . . . until it didn’t. And then my life changed — not instantly or magically, but profoundly. 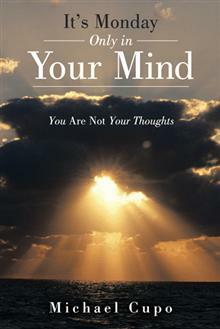 I share this change in It’s Monday Only in Your Mind: You Are Not Your Thoughts. I discovered that I wasn’t dependent upon a substance or activity, but ruled by my ego. My need to reach outside myself for fulfillment was created by a false perception of deficiency. If this sense of lack didn’t exist in me, there wouldn’t have been a need to reach and grasp. My credentials for writing this book are simply that I live this change each day. My view of life is so different from the way it used to be. Through the practice outlined in my book, I have learned to quiet my mind enough to allow my heart to open. The quieter my mind becomes, the more Love becomes the default setting of my life. This is truly a modern-day miracle, a miracle that can happen to anyone who has the desire to change. I grew up in Newark, New Jersey, one of six children. I have been married for 26 years. I own a home, and I have two children. I have been at the same job for 30 years. I am the happiest I have ever been and it is all because of the Love that has always been in my life. I attribute all that has happened to me to that Love. None of what has transpired in the last nine years of my life has anything to do with any accomplishments on my part.